I first encountered Tom Bolton's writing through two small but rather wonderful books, both about aspects of London which fascinated me. The first of these surveyed the familiar territory of the 'lost rivers' - a subject which I've happily wittered about for years to anyone who'd willingly listen, and to many who wouldn't too. Tom's book was well-written, often surprising and perhaps best of all, packed with detail - three things which haven't been true of many of the numerous books on this subject aside perhaps from Nicholas Barton's early and definitive work. Tom's focus on loss continued as he moved on to write about the entire districts which London has managed to carelessly unmap over the centuries of its fractious, ever-reforming existence. Whole locales which were one notable or notorious, but are now preserved perhaps only in a street-name or a pub sign left behind by the pace of social or economic change. Bolton's work delights in sharing this secret knowledge, it is entirely generous, and never glib or pompous. This is expansive, accessible and democratic writing about place. These qualities are, in my experience - and indeed in my own attempts to write on some of these topics - remarkably rare. In this new and somewhat more personal effort, Bolton writes about a journey around the ragged and marginal coastline of Essex. That alone would have attracted me to this book, but doing so at this intemperate and disrupted time makes it all the more compelling - his subtitle is an additional hook. He and his partner divided the epic coastal walk into weekend-sized adventures, gradually progressing around the shifting and often ill-defined landfall of the eastern edge of Britain while the country disintegrated from within. Carefully edging around the curiously unpeopled but ever industrious dumping grounds of the Thames Estuary, or navigating the starkly empty reaches of mud and shifting sands on the North Sea coast, they plot a course rarely walked. Indeed its a course which may not remain possible for long as the scouring waters of the sea reclaim inches of coastline, feet of cliff-face and wide expanses of low-lying saltmarsh with each new stormy season. The path on their map is sometimes a memory before they even reach it, and almost certainly both the country and its fabric will be changed forever by the time one reads this book. As Tom and Jo work their way around the coast, they are drawn into the history and literature of the place - often unexpectedly and sometimes unwillingly encountering an Essex narrative which appears utterly different from the one sold on reality TV and accepted lazy into the zeitgeist. But what of Brexit? Is it simply the case that getting any journey-related book published nowadays is significantly more likely if it somehow promises to take the pulse of a divided nation as the perambulation takes place? In this case, not so. The underpinning ideas of Brexit: unbridled freedom, set-in-stone (small C) conservatism and the cosy protectionism of Empire, are woven into the fabric of Essex in a much deeper sense than some other areas. Even others where the Leave vote loomed largest as it did here. Some of the places which Bolton visits have little connection to London, let alone Brussels. Railways severed, wharves decommissioned and roads often impassable due to flooding, these zones are self-contained and shun external influence. As the path along the sea defences edges further out and eventually disappears into shifting salt marshes, it seems more and more natural that these areas wanted out of the EU. They are connected with nothing, let alone something which seems, even conceptually, utterly distant from the experience of life on the very edge of the Kingdom. At one point, as Bolton shuffles through drowsy, hungover Jaywick - somewhere which ought to be kicking and screaming for any source of funding - the lack of shacks festooned in Vote Leave publicity is a surprise. But of course, it shouldn't be. It's simply assumed that you don't need to be persuaded here. Leave is a natural, unchallenged response. The landmass, drowned and murky though its borders are, has been repelling all-comers for generations. Let's just make that official. Throughout Low Country, Bolton's topographical writing is beautiful and evocative but carries an architects' precision in its expression. The monotony and alien same-ness of the sands and mudflats ought to lie beyond easy description, but he has new observations and new intonations for each of the subtle shifts he finds as land gives way to estuary and imperceptibly becomes ocean. There are few people to be found out here, but those who appear are written as the kind of brief, flickering ghost-presences which I too have met on lonely paths through the marshes. In that sense alone, the book is an essential read - this journey which few of us will take deserves to be recorded. It has a heritage in the tradition of landscape authors who once regarded Essex as worthy of note and recognised its surprising difference to England at large. 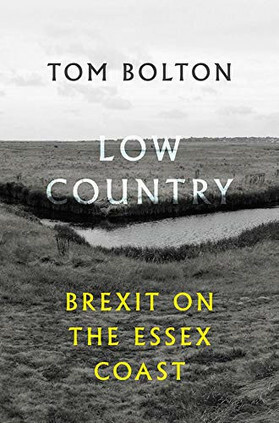 But Bolton's book goes beyond a description of the terrain, and somehow gets under the skin of Essex while it does the same to him in return. In the closing section, where he walks the treacherous Broomway over Maplin Sands and the expansive, reflected mud flats become inseparable from the sky, he captures something essential of the Essex coast and its liminality. Later, he experiences for the first time a newly developed allergy to pollen - the marshes have returned his attention with interest. There are commonly thought to be two distinct tribes in the UK just now, and we are all required to identify vigorously and loudly as Leaver or Remainer. This does us all a disservice - we're more complicated than that and deserve to be listened to fully and fairly. We're all a product not just of the culture which has nurtured our midset but also of the topography which we inhabit. Tom Bolton has delivered in Low Country, the rarest of things - a book packed with both poetic topographical description and pointedly observed social detail. A work which ultimately concludes that perhaps isolation breeds greater isolation, and which sounds a cautionary note about the relationship between disconnection, dislocation and discontent. He treats both the land he walks and the people he meets with evident respect and an open mind, even when he very clearly finds them challenging his own reality.